We decided to set up a support group / forum called Wearing 2 Hats (W2H). i.e. those of us who are staff and also receive services. The forum is an initiative in our organisation that supports staff who have come together with common goals (i) to support staff with their long term conditions (both mental health and physical health challenges, (ii) to support staff who care for their loved ones with their own challenges (iii) to support managers in the role of supporting their staff with lived experience and (iv) to support the organisation to be a more compassionate and caring place to work. Please briefly describe your project, group, team or service, outlining what you do and why it makes a difference. Feedback from our staff through the NHS Staff Survey told us that we could be doing more for staff well being. Our sickness data highlighted that Mental Ill Health is one of the main reasons for working days lost and talking to our staff highlighted that we needed to be doing more to support them emotionally. This is when we decided to set up a support group / forum called Wearing 2 Hats (W2H). i.e. those of us who are staff and also receive services. The forum is an initiative in our organisation that supports staff who have come together with common goals (i) to support staff with their long term conditions (both mental health and physical health challenges, (ii) to support staff who care for their loved ones with their own challenges (iii) to support managers in the role of supporting their staff with lived experience and (iv) to support the organisation to be a more compassionate and caring place to work. Once we’d decided to set something up, we needed to find out what people needed it to look like, this was done with staff in an anonymous survey to ascertain the views of staff around the issues of mental health. It was from this feedback that the three work streams were developed. The three themes are as follows: Peer Support – Providing peer support and a safe place to talk about our own experiences. To feel safe to discuss work with people who have been through similar things. This group will feed key themes into the other two workstreams. Policies and Procedures – Developing guidance for managers and being proactive in supporting better Trust policies. This will support flexibility and thinking of the whole person not just the need to follow a policy. Guidance for managers will support them in ‘staying human’ when dealing with work issues caused through mental ill health, such as sickness absence. Anti-Stigma – An Anti-Stigma campaign where staff from across the Trust ‘come out’ to talk of their mental health challenges, showing that anyone in any role could be affected by their mental health, and that’s ok. Even better it could help them be a better NHS employee. What makes your service stand out from others? Please provide an example of this. How is it making a difference? The work underway (taking place above and beyond everyone’s usual role) has already started to change the culture in the Organisation. It is fully supported by our past and present Chief Executive’s (our previous CEO featured in our Anti-stigma films) and senior leaders, who all appreciate that staff with their own lived experience will support us all in making CPFT a better place to work and receive services. The group have already been working in partnership with HR on the development and review of policies, including sickness and professional boundaries policy. Developing a checklist and some practical guidelines for managers when they are supporting a staff member in work with their own mental health challenges, such as how to time the arrival of letters and how to change the language in templates to cause less anxiety. We have been instrumental in pushing for a reciprocal agreement which will ensure our own staff can access inpatient support in a neighbouring Trust, if this is required. We are also in the process of helping the organisation establish a ‘staff access pathway’ something that the group feels is essential so that if any staff member becomes unwell they can access timely, appropriate and confidential treatment and support by someone that they feel comfortable with. Having a forum such as wearing 2 hats, improves how we care for our staff and how we relate to those receiving services. Recovery is at the heart of this group and it supports our new values: PRIDE Professionalism Respect Innovation Dignity Empowerment Along with the behaviours associated with these such as: Kindness, openness, empathy and supporting others in building resilience and feeling empowered. The anti-stigma work stream aims to help staff feel comfortable to ‘come out’ and talk about their own mental health and celebrate the positives and attributes that having our own lived experience brings to the table. We have developed a range of anti-stigma videos that can be found on our You Tube channel, below are an example of the videos: https://www.youtube.com/watch?v=f9SkSe4V0CU https://www.youtube.com/watch?v=KiSt3rhRqRM https://www.youtube.com/watch?v=-ZINvS177Xg The videos have been supported by a poster campaign and staff stories book, which can be viewed on our website – http://www.cpft.nhs.uk/wearing2hats.htm The peer support element of the group allows staff to come together in a safe and welcoming space to talk about the issues that are troubling them or they wish to get a shared view on. The group is quickly gaining momentum and gives staff a place to meet to talk about any issues that arise and to help focus their collective energies and make changes and recommendations in the organisation. We appreciate getting to a meeting is tricky for some of the workforce, so have now increased support through a Buddy System, whereby staff can call, visit a member of the team known as a buddy if they feel they need a non-judgmental listening ear and possibly some sign posting to services available to them, or additional support. The forum and the peer support group are committed to sharing the learning with the rest of the organisation and its wider partners. There are now a number of staff support groups within Mental Health Trusts and we feel we need to be sharing the work of all of these to wider NHS organisations and mental health services. We are also part of a health and wellbeing network group (Cambridge Biomedical Campus Wellbeing Network) in Cambridge, whereby documents, posters and leaflets about the group have been shared with other NHS, third sector (Mind) and Private organisations. We have also been working with other public sector organisations including the Police, Fire and Rescue, Ambulance, and the Councils to see if we can work more closely together to support our staff with their own long term conditions. Do you use co-production approaches? If so, please illustrate how you involve individuals, families and carers to drive improvement and deliver services? Do you share your work with others? If so, please tell us how. We have tried to be more active on social media with our anti-stigma campaigns and sharing our publications such as the staff stories book outlined above. We also share through the mental wellbeing of staff special interest group of the Positive Practice Collaborative. Whilst above highlights the quantitative evidence around the success of Wearing 2 Hats, we believe it’s the change in culture, and qualitative feedback that we receive that indicates the real differences its making for our staff, and in turn our colleagues and service users. Wearing 2 Hats is developing our culture and interactions so we are more supportive, better equipped and not afraid to have positive conversations about mental health and any other long term condition. The programme has not been formally evaluated, however it does form part of the Health and Wellbeing Strategy and in turn the Workforce Strategy (5 years). In this time we have seen improvements in both how staff feel supported around their health and wellbeing and their engagement in the Trust. Our Staff Survey has highlighted the following: Survey Question/statement 2014 2016 % staff suffering from work related stress (in last 12 months), improvement from 50% in 2014 to 42% in 2016. % would recommend Trust as a place to work, in improvement from 35% in 2014 to 51% in 2016. % agree with ‘my immediate manager takes positive interest in my health and wellbeing, an improvement from 62% in 2014 to 73% in 2016. % agree with ‘my organisation takes positive interest in my health and wellbeing’, a deterioration from 36% in 2014 to 31% in 2016. Whilst it is disappointing that staff feel the Trust takes less of a positive interest in their health and well being, the majority of the work the Wearing 2 hats groups have completed are around supporting managers to better support staff, which has increased from 62% in 2014 to 73% in 2016. The group has different leads for the different workstreams. Each workstream has input from other members of the group, this supports the group in being more sustainable. The Trust has recently re-launched the Diversity Network, who wish to provide the strategic direction, energy and momentum for promoting and maintaining equality and diversity across the Trust. This has bolstered the structure and also the support for the Wearing 2 Hats group. They champion the work of the Wearing 2 Hats group and again will support the sustainability of the group. The group has a terms of reference and has flexibility built in, so as we feel a workstream is completed we will move on to the next relevant thing, constantly asking for feedback and constantly moving the agenda forward. Looking back- what you would have done differently About 5 years ago we put out a request to see if staff wanted to come together in a forum to support each other or to help the organisation make improvements to the way staff are supported. Only 2 staff members came forward at this point so unfortunately we decided there was not enough support to make this work, so it went on the back burner. Subsequently we put this opportunity out to the organisation about 3 years ago and no-one came forward at all, so once again it was shelved. However more recently there seemed to be an appetite for staff to come together with the purpose of supporting each other, so we put out a request again and we had about 20 people contact us to say they would be interested. This continues to grow each time we meet and as more people ‘come out’ about their own challenges then it paves the way for other staff to do the same. I think in hindsight what we should have done years ago was brought the 2 people together to form a small group and then see if it would gain momentum as it has done this time. I think by not doing this we may have lost several years’ worth of positive work that we could have achieved. Challenges and how you overcame them One of the challenges that we have encountered is for managers to provide protected time for staff to attend the forum, rather than it feeling as though this is luxury time out. With the increase in workloads and a shortage of resources staff feel under pressure to do more, and often this means that the support they need themselves gets neglected. By promoting the Wearing 2 Hats forum through Senior Leadership group and through HR and Occupational health. 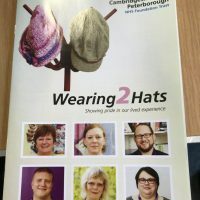 The Wearing 2 Hats group is seen as part of the support network that keeps people well and at work. We have also added a Buddy scheme, which is an initiative that has evolved out of the Wearing Two Hats group and is designed to provide a listening ear to colleagues within the Trust who have their own mental health challenges and are in work but may be having a particularly bad day. Several colleagues, some of whom have their own lived experience and others who are “allies” (ie people who do not have lived experience but are passionate about this issue) have volunteered to become “buddies”. Our Organisation has changed considerably since the group started, having moved from a predominantly Mental health Trust to an Integrated Care Organisation. The language we use such as ‘Recovery’ is not as well understood by those in the physical health side of the Trust. So, more thought is needed when promoting who we are and what we can offer. It has also highlighted that we have other staff with lived experience of conditions such as; Diabetes, Irritable Bowel Syndrome, Cancer and Stroke, they also wear 2 hats. So we have opened up the groups remit further to support, represent and lobby on the issues of staff with any long term condition. Another challenge was the number of staff who were keen to be updated but didn’t want to be seen as being involved, due to the Stigma associated with mental health. The number of staff feeling this way has reduced, with more now coming to the meetings and feeling comfortable in opening up to their managers and colleagues. Again, the engagement with Senior Leaders and the Anti-stigma campaign, along with the increasing numbers attending each meeting has highlighted that they are not alone. We now have over 70 staff members as members of the W2H forum. The Trust will ensure fair and equitable access to all of its services, wherever they are needed, whether by patients, carers, staff, volunteers or members of the community Embrace Diversity – The Trust will recognise and embrace difference, within its workforce and among those who live, work and receive care in Cambridgeshire and Peterborough Embrace Inclusion – The Trust will welcome and celebrate diversity within the Trust and the wider community and aim to be an employer of choice, creating an environment where everyone can develop their talents, prosper and succeed Our priorities for 2018/19 are: • Improvement capturing staff ethnicity data e.g. BME, Disabled and LGBT staff. To get a better understating of the diverse staff working within the Trust • Increase the number of Diversity Champions and raise the profile of Equality Diversity and Inclusion (ED&I) agenda • Further training, education and development for specific work streams • Improve our processes and practices to ensure the Trust is inclusive with regards to the 9 protected characterises as set out in the Equality Act 2010 • Celebrate diversity by understating the diverse staff who help deliver our services. The Trust also seeking to recruit Diversity Champions to help effectively embed all aspects of the equality and diversity agenda, by acting as role models, supporting change and improvements when necessary. If you are interested in becoming a Champion or just curious about the Embrace: 2018 campaign, then contact: Sue Rampal, Equality and Diversity Officer, at sue.rampal@cpft.nhs.uk or Sharon Gilfoyle, Head of Inclusion, at sharon.gilfoyle@cpft.nhs.uk who are leading this campaign. The W2H forum plays an important part in the EMBRACE Campaign.